The Mt. Lebanon School District is looking for community members and Mt. Lebanon High School Alumni who are passionate about their profession or area of interest and would like to share their expertise with our students. The newly launched Mt. 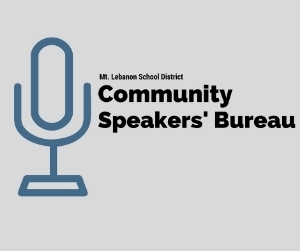 Lebanon School District Community Speakers' Bureau will connect our teachers with individuals who have a desire to "pay it forward" by offering a presentation or sharing a skill or passion with the next generation. Additionally, all teachers in the district will have access to the information collected so every student in the district can potentially take advantage of this collaboration. This initiative is led by the High School STEM Academy and the Global Studies Program departments.